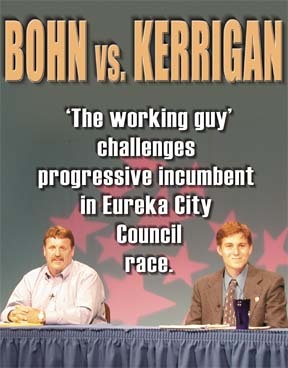 North Coast Journal - Oct. 21, 2004: COVER STORY - Bohn vs. Kerrigan: 'The working guy' challenges progressive incumbent in Eureka City Council race. On the cover: Rex Bohn and Chris Kerrigan at a KEET debate televised last week. IT TAKES REX BOHN A LONG TIME to get to his seat in a restaurant. Even before he's inside the building, he is busy socializing. "Hi, girls!" he says to a pair of grey-haired women headed to their car in the parking lot. "How's it goin' today?" Two Humboldt County sheriff's deputies saunter out the door. "Who's out suppressing crime and violence if you're here?" he assails them, laughing. Once inside the front door, he catches the eye of a waitress who went to grade school with his son. "Hey, honey," Bohn says, smiling broadly. "How ya doin'?" And on it goes: the retired men sitting at the counter, the other waitresses, and nearly everyone who walks by Bohn's table gets a wave, a "how-ya-doin," or a pat on the shoulder -- and always a smile. The affection is returned. "We're rootin' for you," one elderly woman says with a thumbs-up. "We'll get it done," Bohn replies. Bohn, a Renner Petroleum truck driver who worked his way up to operations manager, is getting a lot of attention these days for his bid to unseat incumbent Chris Kerrigan (see accompanying story) in the Eureka City Council race for the 4th Ward. The 50-year-old Republican emphasizes his experience over that of his young rival and says he can get things done for Eureka. How? Because he knows how to talk to people. Indeed, Bohn's mastery of the lunch crowd at Adel's restaurant on a recent weekday reveals him as a consummate politician, though Bohn himself would cringe at the term. "I've got a career when I retire, and that's gonna be maintaining the ball fields," he says, referring to the six soccer and three baseball fields that make up the 11-acre Redwood Fields in Cutten, which were created in large part through his volunteer efforts. "I have no aspirations" for higher office. Bohn grew up in Myrtletown, not far from the Park Grocery on Harris Street, which his parents, Herb and Jane Bohn, owned. When Rex Bohn was 19, his father died, but not before impressing on his son the importance of public service. "He always told me when I was younger, if you want to make a difference, get involved in the community," Bohn says. "I've probably taken that to an extreme." Bohn started his volunteer work when he was in high school at St. Bernard's, helping out in a classroom at Glen Paul School. In his early 20s, Bohn worked on the Special Olympics, motivated in part by a developmentally disabled relative. When his son, Trevor, or T-Bohn, as he is known, attended Ridgewood School in Cutten, Bohn won three PTA awards for service, he says. He's also spent years coaching kids' soccer and baseball. Bohn got perhaps his greatest lesson in how things get done in Eureka through his work as the primary organizer behind Redwood Fields. "We were really short on playing space in the community for soccer, baseball. They would [sometimes] cancel a game because they didn't have a field." One of the boys on his soccer team at the time happened to be the son of Bob Simpson, then general manager of Louisiana-Pacific Corp. Bohn says Simpson recognized the problem. "He said, `If I give you some land, could you build a field?" Bohn remembers. The lumber company deeded the land at the end of Fern Street to an organizing committee, which rounded up donations and volunteers from all over town. "That was probably the best example of the community coming together and organizing something that would last forever," Bohn says. 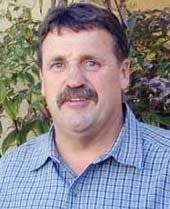 His visibility in the community also got Bohn a governor's appointment 10 years ago to the Redwood Acres Fair Board, on which he serves as president. In his professional life, Bohn personifies traditional, blue-collar Humboldt County. After a five-year stint as owner of the Fourth Street Connection, a bar and restaurant near F Street at the edge of Old Town, drove truck for Renner, delivering diesel and home heating oil to local customers. After 20 years with the company, he's worked his way up the ranks; he now supervises 10 or 12 drivers, dispatches trucks, tracks inventory and gets behind the wheel himself when they're short-staffed. Bohn says he sees his council campaign as just another example of his efforts to make a contribution. "People had asked me and said, `Why don't you [run]? You have a wonderful gift of talking to people,'" he says. "I want to serve the city." In order to encourage the building of more homes, Bohn says he would make it easier for builders to get permits and start construction -- and his list of campaign donors reads like a who's-who of Humboldt County builders and developers (see box). He'd also streamline the permitting process for businesses that want to move here or expand here, he says. In contrast, Kerrigan has earned a reputation as a "no growth" advocate through his proposal last year to create a retail ordinance and his alliance with like-minded officials, according to Thomas Hannah, a former Eureka City Council member and Bohn supporter. Also high on Bohn's list is crime, and he says he does not believe in cutting budgets for police and fire -- a position that may have helped him win the endorsement of the Eureka Police Officers Association. Kerrigan, on the other hand, said during a televised debate last week that he had had to "make some tough decisions" regarding police budgets, holding off on salary increases to keep more police on the streets. Though Bohn insists that he wants to "take the high road" on his campaign, some of his supporters are not shy about trashing his opponent. "The extreme environmental movement is trying to take over every aspect of Humboldt County government," and Kerrigan has let them "align themselves with his campaign," said Eureka businessman and Bohn supporter Tom Cookman in a radio commentary last month. Cookman pointed out that Richard Salzman, who led District Attorney Paul Gallegos' successful fight against a recall attempt, works on Kerrigan's campaign. Salzman raised the ire of Bohn supporters by sending out an e-mail to the Friends of Kerrigan list speculating on what part Bohn plays, as a Renner employee, in the region's high gas prices. On the contrary, Cookman said, "Rex is not in the pockets of big business." Another issue that has been discussed widely among Kerrigan opponents is the now-infamous pot pipe incident. The Times-Standard reported in July that a marijuana pipe was found at Kerrigan's home while he was housesitting at another residence. No charges were filed, and Kerrigan denied at the time that the pipe was his. At the televised debate, Kerrigan was asked how the pipe got there, and whether he supported the idea of recreational drug use. He answered neither question directly. "The people of Eureka want honesty," Bohn told the Journal. "They want integrity in their elected officials, want them to take the moral high ground," Bohn says. "I don't think there's anything recreational about an illegal substance." The main difference between him and Kerrigan, Bohn says, is experience. He pauses for a moment to talk to a young man he knows who used to coach soccer. Bohn tells him he should get back into it and gives the man his number. Then he returns to the question. That, right there, he said, is also what he offers: his familiarity with the people of Eureka. "My knowing the people in the community and what they do. I'm not a politician. I'm just Rex." 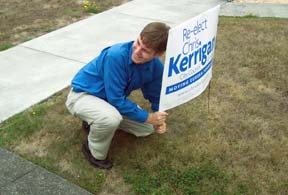 IN AN UNSEASONABLY MUGGY AFTERNOON last month, Chris Kerrigan gathered up his campaign materials and prepared to walk up and down the length of B Street, knocking on doors to seek support for re-election to the Eureka City Council. "If I could give advice to anyone running for political office, it would be to walk the neighborhoods," he said. "That's how you learn first-hand about your constituents' experiences." Door-knocking is something of a religion to Kerrigan. Many credit his zeal for walking the neighborhoods with putting him on the council in 2000. As a 20-year-old college student and graduate of St. Bernard's High, he upset incumbent Connie Miller that year with just over 60 percent of the vote. He said that since being elected, he has hit the streets not for politics, but for purposes of government -- when a big issue like Calpine's proposal to build a liquefied natural gas facility on the Samoa peninsula comes to town, he'll knock doors to solicit the opinions of people who don't normally come to City Council meetings. For this election, he's made it a goal to hit every house in town before Eureka goes to the ballot on Nov. 2. If that represents a scaling-up of his campaigning, it would only be in keeping with the significance attached to the race. Kerrigan's defense of his seat against challenger Rex Bohn is probably the most closely watched local race this season. On both sides, it has absorbed most of the pent-up passion left over from last spring's DA recall campaign. In many ways, and despite his four years in office, Kerrigan still comes across as a fresh-faced kid. When listening to him talk about issues the city faces, it's easy to slip into the error of thinking of him in terms of his potential, rather than his accomplishments. But unlike in 2000, Kerrigan now has a record to run on -- and, to hear him tell it, a philosophy of government. It's that, as much as anything, that he feels sets him apart from his opponent. "I feel that I have more experience, and a track record, but I also think my approach is more innovative and more likely to be successful," he said. If there has been any prominent issue in the race -- which has often seemed more a personality contest or a skirmish in the local culture wars -- it has been development. Most of the county's largest developers have lined up behind Bohn -- probably, Kerrigan said, because he hasn't always given them everything they want. "I've supported development and developers, but there's times when you have to stand up to developers when it's in the community's best interest," he said during a recent League of Women Voters debate. 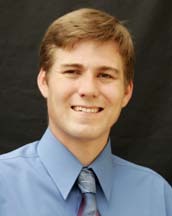 During his tenure, Kerrigan has worked for measures that would give the city greater control over building within the city limits. He has championed city design review standards and historic preservation districts as tools for preserving the character of Eureka's downtown and its neighborhoods. He unsuccessfully tried to get the city to pass a "big box" ordinance that would require chain outlets to get a use permit before being allowed to build new mega-stores. However, significant sectors of the building community have announced their support for Kerrigan. William Pierson, owner of Pierson's Building Center, has supported his campaign to the tune of $6,245. Both the Building and Construction Trades Council of Humboldt and Del Norte Counties and the local Central Labor Council -- which represents many other unions associated with construction -- have also endorsed Kerrigan. Jim Smith, president of the Central Labor Council, said last week Kerrigan's accessibility and his willingness to seek out the opinions of his constituents was a major factor in his group's endorsement. "He's a quick study," Smith said. "If he has a question about something, he never hesitates to call and ask about it. Frankly, I wish more of our elected officials would do that before forming an opinion on issues." 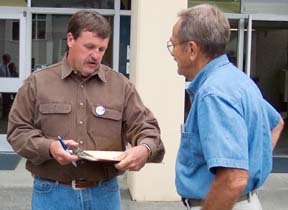 Dave Wiseman, president of the Building and Construction Trades Council, agreed with Smith, and said that the Bohn campaign's portrayal of Kerrigan as an anti-growth candidate misses the mark. "A lot of these young guys get on your nerves in various ways, but Chris isn't one of them," he said. "Chris is a younger fellow with some high ideals, and is very concerned about the citizenry having plenty of quality-wage jobs. He's not against growth." Kerrigan has said that one of the largest obstacles to economic development in the county is its poor transportation infrastructure -- something he has worked to improve during his tenure. As chairman of the Redwood Region Economic Development Commission, he helped secure matching funds for a Federal Aviation Administration grant that will bring direct service from the Eureka-Arcata Airport to Los Angeles next year. He traveled to Washington, D.C., to lobby for improvements to Buckhorn Summit, a perilous seven-mile stretch of Highway 299 that prevents industry-standard trucks from entering the county. Kerrigan said that because he is still young and has no family responsibilities, he is able to devote much of his time to government. He supplements the $500 a month he is paid as a council member with occasional political consulting, painting houses with his father and the financial aid he receives as an HSU student. Following Kerrigan as he walks the neighborhood, stumping for votes, one thing quickly becomes clear: He is far from a natural politician. The glad-handing side of the business seems to stymie him. Paradoxically, for a devotee of door-to-door campaigning, he clearly feels uncomfortable in asking for someone's vote -- he approaches the issue with shyness, his smile looking a bit pasted-on. On the day he campaigned on B Street, his discomfort was accentuated by the foul weather. The high humidity caused sweat to bead up on his face after the first few blocks. Nevertheless, Kerrigan soldiered through, giving everyone a version of his pitch -- young people who light up when Kerrigan introduces himself, polite skeptics, proud nonvoters, out-and-out fans -- and asked for their support in an aw-shucks tone of voice. There were times, though, when Kerrigan's nice, hesitant kid persona evaporated. Kerrigan asked everyone who answered their door whether they had any questions for him. When they did, Kerrigan could switch to talking about government. The change was remarkable -- suddenly, it was as if a cool dry breeze had drifted in off the bay, evaporating the shy 24-year-old and leaving a seasoned policy-maker in his place. One place this happened was at the home of Frank and Carol Maurer. Frank Maurer was standoffish at first -- he was upset at the state of the neighborhood, just on the border of the poorer west side of the city. "It's all the dumping of all these places in this district," said Maurer. "This district has 99 percent of all those halfway houses and drunk houses and drug houses. They put them all here. They don't put them where they live, they put them here." "Well, part of the problem is the zoning," Kerrigan said. "You know, this is the one area in the city where there's no regulations, really, on how big you can put in apartments. And I've really worked to have some more consistent zoning, zoning that fits the neighborhood. And also, you know, every one of these houses is susceptible to putting in a big apartment complex. So I've worked really hard to make sure that we have design review standards, so they have to go in so that they fit into the community and have quality construction, so they don't detract from the neighborhoods." "But it isn't so much the apartments as it is all the subsidized housing, and all the halfway houses and the juvenile houses and all this kind of stuff," Maurer said. "If this area is zoned differently from the rest of the city, let's zone this the same as the rest of the city. Or zone the whole city like this area! "If my house was on the other side of Wabash, it'd be worth an additional $50,000." "Well, I have been working for improvements to this neighborhood, like the addition of street trees, of things that raise property values," Kerrigan said. "So I've been a really strong advocate for these neighborhoods." Kerrigan and Maurer agreed that his particular issue -- rehab homes in the neighborhood -- was more the fault of the state government than the city. Maurer held his counsel -- he was still upset about blight in his neighborhood, but he was clearly listening closely to the things Kerrigan had to say. As their conversation wrapped up, his wife Carol chimed in. "Well, good luck!" she said. "We supported you last time, so"
That moment, and a few others like them, served to illustrate the point of Kerrigan's neighborhood-walking campaign. He may have saved two votes for himself -- not by smiling for the camera, kissing babies or making extravagant promises, but by persuasively explaining his stances on issues face-to-face with a constituent. In a small city like Eureka, that's still possible -- if a candidate is willing to put in the work.